Copper Compression Socks-As you might know Copper is a great conductor of electricity. Through our socks, we are extending its natural property to rejuvenate blood circulation through your legs through copper fibers capable reviving blood circulation along with providing a 15-20 mmHg compression. It is ideal for those who sit for long period during travel or at work, provide mild squeezing of warmness and enhance blood circulation in your legs. 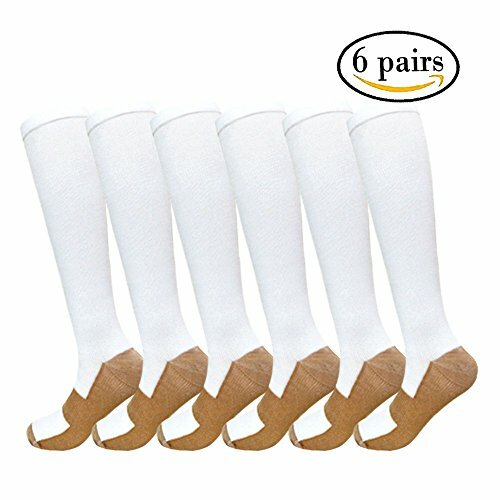 6 Pairs Combo -gift idea to a loved one or a casual friend, this is will reduce your anxiety without even you wearing them . Great gift choice for joggers, athletes, workout fanatics, office workers, ok..can we just say whoever use their leg extensively. 100% MONEY BACK GUANRANTEE: If you do not like our socks for any reason, we offer a full refund or free replacement. No questions asked. If you have any questions about this product by SOOVERKI, contact us by completing and submitting the form below. If you are looking for a specif part number, please include it with your message.